I can’t believe 2018 is over and 2019 has begun. 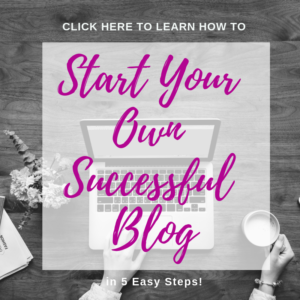 2018 was the year I started this blog and I am really looking forward to what 2019 has in store for the Fit and Frugal Mommy community. 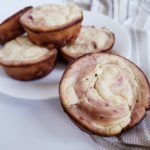 A New Year means new goals – for this blog, for myself, for my family. 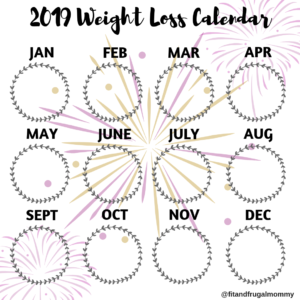 To keep myself accountable I’ve created FREE 2019 Weight Loss Calendars for Instagram and I’m sharing them with you! 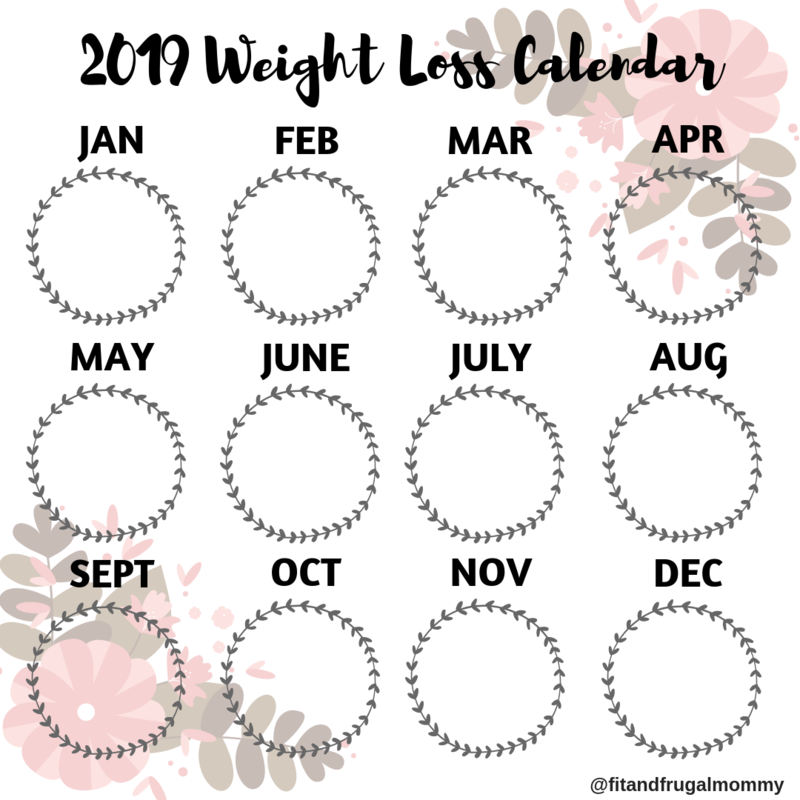 Click the calendar to download or click this link to get your FREE Pink Flowers 2019 Weight Loss Calendar for Instagram. 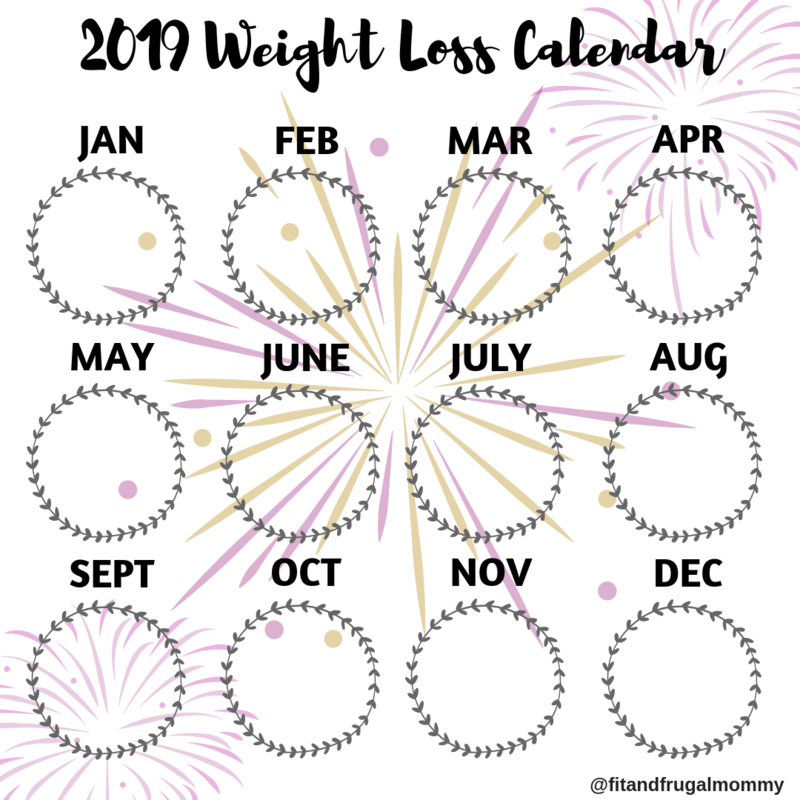 Click the calendar to download or click this link to get your FREE Purple Fireworks 2019 Weight Loss Calendar for Instagram. 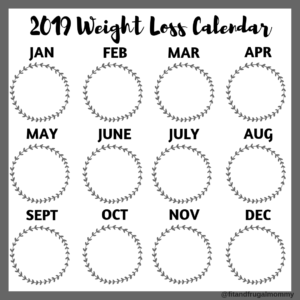 Click the calendar to download or click this link to get your FREE Gray Border 2019 Weight Loss Calendar for Instagram. 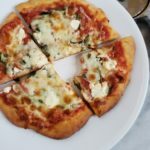 I don’t want to call this post a New Year’s resolution post because I find that most New Year’s resolutions don’t come to fruition. This is a 2019 goals post. It’s easy to wish that something will happen in the New Year, but I am interested in making it happen. 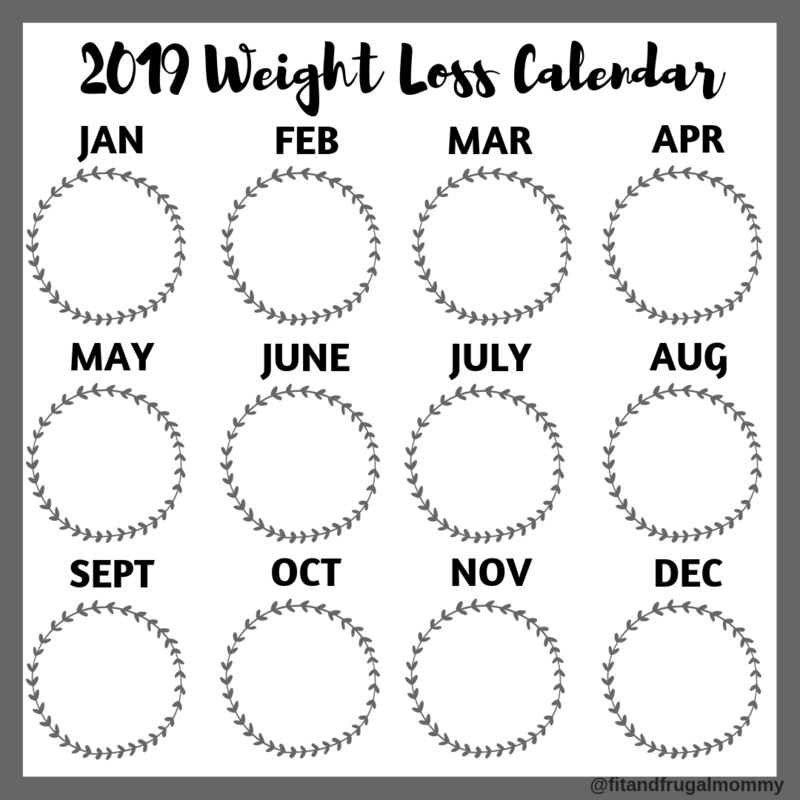 The best way to have a goal succeed is to have a plan, so I’ll outline my 2019 goals and plan below! To lose another 50lbs to reach my 100lb loss goal, I need to work on my other goals simultaneously. Working out at least 3 times a week, drinking more water and trying more healthy recipes that I would otherwise avoid will help me get there. Most importantly though, I need to become more consistent with my calorie counting in MyFitnessPal, until I have a better idea of the calorie value of foods. I’ll also be sure to take lots of photos (which you can see on my Instagram) which I have found are the most motivating factor for me. Currently, I attend two fitness classes a week. In order to make my 3 times a week goal, I just need to add one at home workout. That shouldn’t be hard! Consistency will be key. 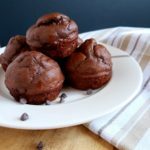 When I started Fit and Frugal Mommy, I thought that running this blog would inspire me to try new healthy recipes to share with all of you and it has. I’ve ate more new things in the last 3 months of 2018 than I have in my adult life. The most surprising outcome from all of that was how much I enjoyed the new foods. I’ve learned that eating healthy doesn’t have to be a steamed chicken breast, broccoli and brown rice. 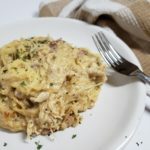 I will continue to try new foods and post them for the Fit and Frugal Mommy community. I’ve also noticed that my water intake has really slipped in 2018. I find myself running after 2 children and forgetting to take a minute to drink my water. I’ve started this morning (and yesterday) drinking 2 cups (500ml) of water before my coffee. I will continue to do this to make sure I have a solid foundation of water consumption each day. A lot of my goals just require commitment. If I want to drink more water or workout 3 times a week, I just need to commit to making it happen. I need to commit to a healthier me in 2019 and that’s the best investment I can make. 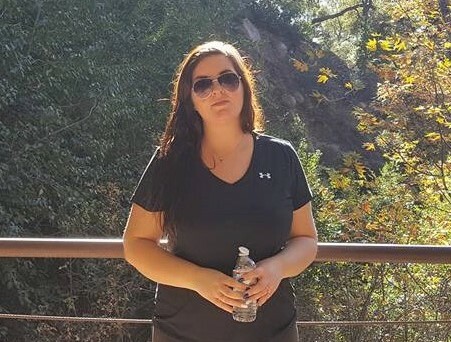 Want to follow along on my 2019 weight loss journey? 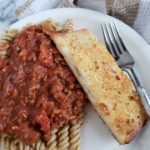 Check out @fitandfrugalmommy on Instagram. 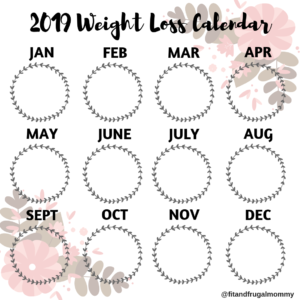 If you’re using the calendar tag me or use #fitandfrugalmommy so I can see how your journey is going!